Last week Brighton published a great blog post about their homepage, and how really, Google is their homepage. Looking at a standard content report for our website shows that our homepage was the top ranked page in March. However, this presents a slightly misleading interpretation of homepage usage as when we look at homepage visits in comparison to all other visits, we can see that actually, over a year, 82% of sessions on our website did not visit the homepage at all. Approximately 15% of sessions start on our homepage. What about the other 75%? The table below shows the top ten pages that customers started on for March. 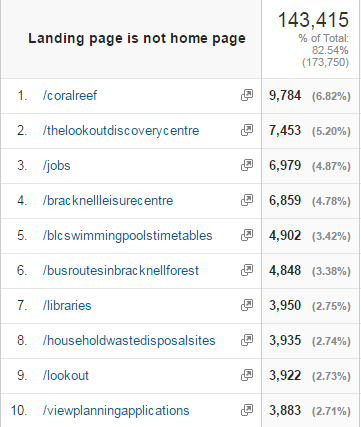 Unsurprisingly, given it’s popularity, and the current work going on, Coral Reef is the most popular landing page, followed by The Look Out Discovery Centre. All of these pages are some of our most popular pages on our site so it is not a shock that these pages would be entry points. 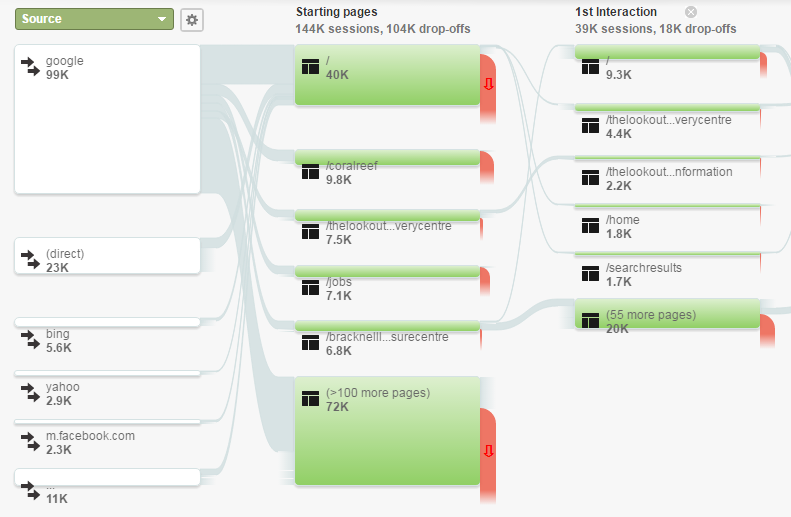 However, this doesn’t tell us how customers are getting to these pages. Do they Google it? Do they have a direct link? What about other sources? According the the numbers, Google is the most popular starting point, and direct links follow. Even more interesting, and something we should probably explore at a later date, is that when we add the homepage as a landing page back into the figures, we see that large numbers of customers are actually still coming to it via Google rather than by other means. Let’s now take a look at those sessions where there is a visit to the homepage after looking at other pages. Why are the majority of our customers not doing this, but some are? To help us understand, we can look at where customers were before they ended up on the homepage. 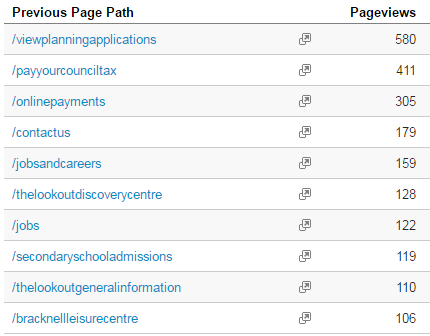 The following table shows the top five pages that people navigated from. What is it about these pages that mean customers decide to head to the homepage after using them? Is it because they do not find the information they want, or is it because they did find that information but wanted to do something else? These pages are generally well used, but perhaps they are failing customers in some way that results in the backtrack to the homepage. Some focused user testing may be in order to see if we can work out why this is happening. Another key indicator we can look at in relation to homepage usage is time spent on the website. In March, the average time spent on the website when the customer did not go to the homepage was 1 minute 46 seconds. If the session included the homepage this jumped to 3 minutes 41 seconds, suggesting that those customers who go to the homepage navigate around a lot more before they find what they want. They may also be interested in more than one thing. Again, we need to be monitoring how our customers navigate much more closely in order to understand this. We shouldn’t over engineer the homepage. It doesn’t need to be fancy but it does need to provide customers with a simple way to get to the information they need. Customers should also be able to find what they need quickly. We must focus on the content and ensure that customers can get to it through the channels they want – for example, let’s make sure that customers can find our content easily through search engines. We’re already doing some of this for the new website. We’re trying to keep the homepage as simple as we can, with clear navigation into services. In our first wireframe testing last week, users really liked this, and found it clear and easy to use. Once we have some stats on our new homepage, it will be very interesting to run a comparison.